An antique gallery, Borneo Artifact features Asian artworks and antique items, including tribal masterpieces, which art lovers can appreciate and purchase from for their personal collection. 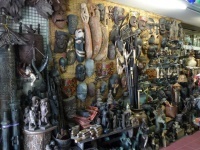 freePRnow.com, 11/08/2018 - Sarawak, Malaysia (November 08, 2018) - Borneo Artifact is an Asian Antique Gallery that has an extensive collection of masterpieces from tribal natives. It has Totem poles, Gongs, weapons such as blowpipes, parangs, mandamus and keris, weavings, basketry, shields carvings and more. Art enthusiasts who appreciate Asian Antique items can also choose from other things such as Textile pua kumbu, necklaces & body jewelry, musical instruments, ancient containers, masks, statues & sculptures, Fossils findings, piercing & tattoo, Ear weights, Panels & doors carvings, Traditional Carriers, Ethnographic Books, Artworks and more. The gallery comprises of Indonesian tribal antique, indigenous art work, local crafts and native vintage items that showcase the culture, history, heritage and traditions of Borneo. It has ancient Asian Antiques, collectibles and artworks. It specializes in souvenirs, crafts, World War II cannons from the Brooke era, weapons, headhunters / hunting trophies, traditional musical instruments, charms, collectibles, antiques, artifacts, tribal native arts and more, all of museum quality. Other than buying Asian Art items, customers can also look at the wide range of products that have been sold by the gallery and appreciate their artistic beauty. The collection of this gallery is primarily from South East Asia, and features artistic items from Sipadan Island, Sumatera, West Papua, Kalimantan, Sulawesi, Lombok, West Timor, Alor, Sumba, Flores, Komodo and Bali. The store ships all ordered items by courier service, which generally takes anywhere between 4 and 5 business days to reach customers across the world. Borneo Artifact is an Asian Artifact Gallery and crafts store that features antiques and vintage items showcasing the cultural heritage of the 3rd largest island of the world, Borneo. It was founded in the year 1998.